Island Soda Works’ unique low sugar concoctions are creating addicts Island-wide. but by a plum as it fell from a tree lining the road. Thankfully I was able to avoid the fruit missile, but immediately I had to swerve through the slippery piles of smashed fruit on the road. As I carefully continued on my way to work I started to wonder… doesn’t anyone want this fruit? Doesn’t it seem a shame that so much goes to waste? Turns out there are others who feel the same, and they’ve been actively doing something about it. Lush Valley (an acronym for Let Us Share the Harvest) Food Action Society is a fruit tree sharing program that has been around since the 1990s. I had a chance to speak with two of the core members of Lush Valley, President Bunny Shannon and Jean duGal, at their office on Piercy Road. Being the harvest season, the office was hopping, but they still took time from their busy day to describe their program and how it began. Lush Valley has its roots in the 1980s, in a program that asked women to ‘think globally but act locally’ on issues surrounding poverty and food. “And that was before the word local was such a buzz word,” recalls duGal with a laugh. She remembers attending a lot of meetings where she got frustrated because she wanted to move from talking to doing. So she and a small group of like-minded individuals started a program called The Good Food Box. The program was a way to provide healthy fruits and veggies to needy individuals for just $10 per box. Though it was popular and successful, eventually the rising cost of food made the program impossible to continue. “The price of food kept going up and the boxes got smaller and smaller,” she says. But all was not lost, for from that start they instigated the fruit tree program. The idea is simple—a person with too much fruit calls Lush Valley and asks them to come and pick the fruit. Volunteers come out, pick the trees, and the fruit pickers get one third of the picked fruit. The owner gets one third, and the remaining third is for Lush Valley to redistribute or use in their teaching kitchen. “Everyone benefits from the program,” explains duGal. Oftentimes the volunteer fruit pickers are underemployed people who appreciate the fruit they receive. Other needy individuals benefit from the redistributed food they receive from Lush Valley, and the tree owners benefit because they don’t have to stress about the fruit falling off their trees. And don’t forget the bears—most people would rather see fruit pickers in their trees than bears munching on the fruit. “We have a lot of people from Cumberland calling us to pick fruit from their trees so they can keep the bears out of their yards!” Shannon adds, laughing. In order to enhance food security, Lush Valley has created an interlinked set of inclusive programs that are geared to help all people provide healthy foods for themselves and their families. From handing out food and prepared meals to helping teach people to prepare their own, Lush Valley is dedicated to helping people go from being dependent to independent. How have they done all this? Shannon says it has only been possible because of the volunteers who help run the programs. They also regularly receive food from St. Joseph’s Hospital through what is called the Food Recovery Program. About once a month Lush Valley gets a call telling them that there are surplus meals available. They pick up the meals and redistribute them to anyone in need. For example, because of the new government grant Lush Valley now has a Vancouver Island Health Authority (VIHA) certified commercial kitchen. “We call it an incubator kitchen,” says Shannon with a laugh. That’s because they see the space as a place where people can use the kitchen to start their food-based business. For example, one woman started out by using the kitchen to make tamales, which she sold at the Farmer’s Market. Now she owns and runs her own restaurant. Lush Valley also uses the kitchen to provide workshops on cooking, preserving, budgeting and Food Safe courses. One example of these is an after school cooking program for at risk children called The Young Cooks Program. “The kids love being able to come to their cooking class after school,” says duGal. “They feel special and it’s also a chance for the kids to get together and talk with other kids who share the same problems.” The 10 to 14-year-olds come to the Lush Valley kitchen once a week to learn about nutrition and how to cook healthy meals. After they’re finished with their class they’re able to take their creations home to share with their family. Though the new kitchen is up and running, there are still areas of the building that are going through major renovations. “We have some big plans for our space as well as for our programs,” says Shannon. For example, though they don’t know the exact nuts and bolts of the program yet, they hope to provide a group buying service to charity organizations in the future. “There are many groups that could benefit from such a service,” Shannon says. “For example, St. Georges Church provides meals most days for homeless and needy people, but they can’t buy food in bulk because they don’t have the space to store it. They’d save a lot of money if they could buy in bulk.” In essence, the group buying club would help other like-minded groups shrink their food costs, stretching their funds so they can ultimately do more. It’s clear Lush Valley believes in the power of partnerships, as they’ve partnered up with other volunteer-run groups that have the same values. One such example is a group called the Pepper Mill, which works out of Lush Valley’s kitchen to cook and distribute healthy frozen meals at affordable prices to anyone who needs them. Lush Valley also shares their space with the Comox Valley Growers and Seed Savers, with Dawn to Dawn Action on Homelessness, and with Food Not Bombs. Since these other groups are also working toward the ultimate goal of food security for all, it seems logical to those at Lush Valley that they should work collaboratively. Lush Valley has big plans for the future, but those plans can only come to fruition if they have help from volunteers. Lush Valley is located at 1126 Piercy Road in Courtenay. Their hours are 10 – 3pm Monday to Thursday. For more information about Lush Valley call 250-331-0152 or visit www.lushvalley.org. ‘Season Upon Season’ is a cookbook Lush Valley sells to raise funds. It’s available for $15 at Zocalo’s, Beyond the Kitchen Door and at the Lush Valley office. A happenstance amalgamation of circumstances. That is how Mandolyn Jonasson describes her decision to start a soda pop business making naturally fermented, effervescent fruit and vegetable beverages. That was almost two years ago. Today, Island Soda Works is a growing beverage business with a clientele that could be described as enthusiastically addicted to Jonasson’s tasty probiotic drinks. She is in her first year of selling at the Comox Valley Farmer’s Market, and has plans to launch wholesale later this fall. Happenstance doesn’t seem to cover it. In fact, listen to Jonasson tell her story and the words “inevitable” and “determination” come to mind. How else does a pop-addicted, politically-aware food activist become a soda brewer? For that matter, how do you get to be a pop-addicted, politically-aware food activist in the first place? It started on her family’s organic farm in Cook Creek, Manitoba where the family raised strawberries, bees and geese. It carried over to high school when Jonasson joined the Food Not Bombs movement and starting a community kitchen, and continued at the University of Winnipeg with the Canadian Federation of Students. Next, Jonasson travelled to Mexico where she helped build a solar-powered outdoor green classroom at the University of La Paz in Mulege before hitchhiking back up the West Coast to Vancouver. There she connected with residents at Rainbow House—a communal living home on the City’s east-side committed to alternative means of cooking and food production (“They were cooking with Stevia before anyone was talking about Stevia,” says Jonasson)—and learned how to make lacto-fermented ginger ale. A year or so later, she hitchhiked to Quebec as part of the student protests at the Quebec City Summit of the Americas. Shortly thereafter, Jonasson left Canada to spend the next five years travelling between London, France, Spain and North Africa. “The way I travelled was with no money,” says Jonasson. Instead she worked—one memorable job was as a bicycle courier in Paris. Another was her volunteer work with “Restos du Couer” or Restaurant of the Heart, a French charity that distributes food packages and hot meals to the needy. “They came to be seen,” says Jonasson, relating what the street people who attended the weekly meals would tell her. And by seen they meant have someone look them in the eye and speak about ordinary, everyday things. In retrospect, Jonasson’s early experiences are pretty typical for a student activist of the new millennium. The Battle in Seattle had erupted in 1999, and Genetically Modified Organisms, intellectual property rights, bio-piracy, organic farming and food security were in the news. Community gardens were springing up in cities across Canada, and people were turning a critical eye to our food production system. Food had become political. At the same time, the experience allowed Jonasson to develop a whole new relationship with food. For example, African cuisines typically use a combination of locally-grown fruits, cereal grains, vegetables and meat. Refrigeration isn’t wide spread and “everything is the same temperature,” she says. Interestingly enough, pop is common, and that’s where Jonasson’s addiction started. “The sweetness and the bubbles feel so hydrating,” Jonasson says, holding her hands to her neck and tracing imaginary carbonated bubbles down her throat for emphasis. Likewise, France is a country that eats its food fresh and in season. Most residents have only the equivalent of a North American bar fridge, and they shop every day. “When it’s gone, it’s gone. You snooze, you lose,” says Jonasson. Eventually, Jonasson returned to Canada, moved to Montreal and enrolled in the Fine Arts program at Concordia University. Her plan was to start a hostel with a roof garden, and put into practice everything she knew and understood about food. Instead she got sick—very sick. Jonasson was diagnosed with systemic lupus erythematosus (SLE or lupus), an autoimmune disorder where the body’s immune system mistakenly attacks healthy tissue in the skin, joints, kidneys, brain and other organs and creates chronic inflammation. The underlying cause is unknown, however many of those diagnosed find a healthy diet keeps inflammation and flare-ups to a minimum. By the time Jonasson moved to the Comox Valley and transferred to North Island College, the disease was under control. Then she got pregnant. “That changed everything,” says Jonasson. “After I had my daughter I had the worst flare-up of my life. I was dependent on people to help with some of the most basic things. And it was so important to me that my daughter be healthy and that I be healthy. “I started with Kombucha, and then I got sick of drinking Kombucha, and then I remembered ginger beer,” she says. With that came the start of an idea. “I wanted to stay home,” says Jonasson. “Because of my values, it was important for me to be there for my daughter.” Self-employment making a healthy alternative to soda pop seemed like something that could work. 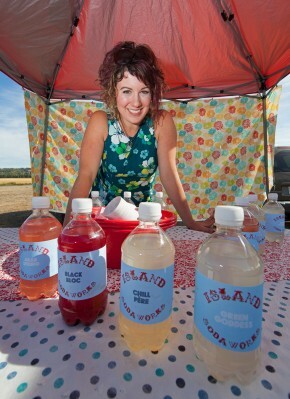 Jonasson borrowed $5,000 from her parents and started Island Soda Works. Jonasson started with friends and family, but knew she needed to sell to a bigger base of customers. That required applying to the Health Department for a licence. The application process was an exercise in patience and persistence for Jonasson. She was the first person to apply to sell naturally fermented soda pop and needed to educate officials about her brewing process, her product, and its safety. Jonasson filled out form after form after form and every time it looked like she was getting somewhere, the Health Department would come back with more questions. “It was frustrating to me because anyone is allowed to put corn syrup and bubbles in a can and sell it, but a healthy product couldn’t get the okay,” says Jonasson. “It’s been around since the 1500s. I had shown I had taken all of the steps necessary to create an acidic environment. Which raises the question—just what is naturally fermented soda pop? The short answer is a drink that has been made fizzy through the process of lacto-fermentation. Lacto-fermentation is when bacteria convert the starches and sugars in vegetables and fruits to lactic acid. The process adds tang to a food, or in the case of liquid, bubbles. Jonasson notes that peer-reviewed studies show lacto-fermentation also increases the vitamin content of food, aids digestibility and adds a plethora of healthy bacteria to the gut. Sauerkraut is one naturally fermented food that most people already know about. Jonasson’s product, though, doesn’t taste like sauerkraut. One of the first flavors Jonasson experimented with was rose, a common flavor in North Africa, the Middle East and, because of colonization, France. Jonasson notes it’s also a good way to drink tequila (along with cinnamon and orange) in Mexico. Jonasson combined rose petals with pomegranate juice, organic honey, organic lemons and yeast to create an effervescent drink with the light taste of rose. It’s delightfully refreshing, and her customers seem to agree. “I’ve gotten an overwhelmingly supportive response,” says Jonasson of her debut at the Farmer’s Market. “It’s possibly the best thing that’s happened to me. “I am so inspired by the sites and smells of the market,” she adds. “I get there and think this looks really good or that smells really great.” A particularly memorable moment was the first time she tasted a snacking cucumber grown by fellow Market vendor Grassy Knolls. “It was so delicious and so rich,” recalls Jonasson. “It was so yummy I wanted to capture that.” The result was a new soda named Green Goddess, a mix of Grassy Knoll cucumbers, mint and lime. And for those thinking cucumber and carbonation don’t go together, be warned—this drink might be one of the best things you’ve ever tasted! This sort of collaboration is typical of how Jonasson runs her business and brews her drinks. She uses seasonal fruit and vegetables, and local ingredients whenever possible. Flavors change with the seasons, unless she’s able to stockpile supplies in the freezer. Apples will play a big role over the winter season. And with that, Jonasson comes full circle with the very interests in food security she started out with. Recently she’s taken that philosophy to the bank and applied for a business loan from the Canadian Youth Business Foundation to expand her business into wholesale. The goal is to launch in November, just in time for the Christmas season. The beauty of the idea is that it allows existing beverage providers to use their existing keg system to serve up a locally produced product. For more information go to www.facebook.com/IslandSodaWorks or drop-in at the Farmer’s Market.